The purpose of this webinar is to explore how customer service organisations and external advisors, where applicable, can adopt a structured approach to the mapping and visual analysis of existing service and sourcing environments. A key step before speculating on the potential benefits of any service transformation journey. 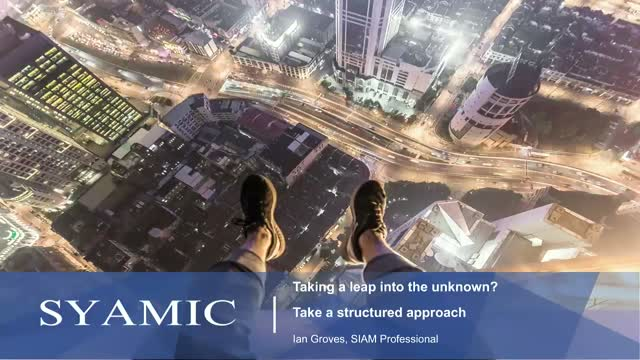 As organisations increasingly look towards SIAM as a solution to multi-service vendor integration, SYAMIC introduces a method to help organisations understand the complexity of their current state. Armed with a complete Service Landscape and an assessment of existing capabilities, customers are able to move forward with confidence to develop strategies to deliver a successful SIAM implementation. It is essential that organisations must, at all costs, resist the temptation to over simplify their understanding of the “as-is” state in the belief that a new SIAM implementation will overcome all of their existing challenges. There are some things which simply cannot be ignored. Therefore, within this webinar we will explore a simple three level framework which provides structure, a common language for customers, advisors and suppliers alike and drives true collaboration across the ecosystem.